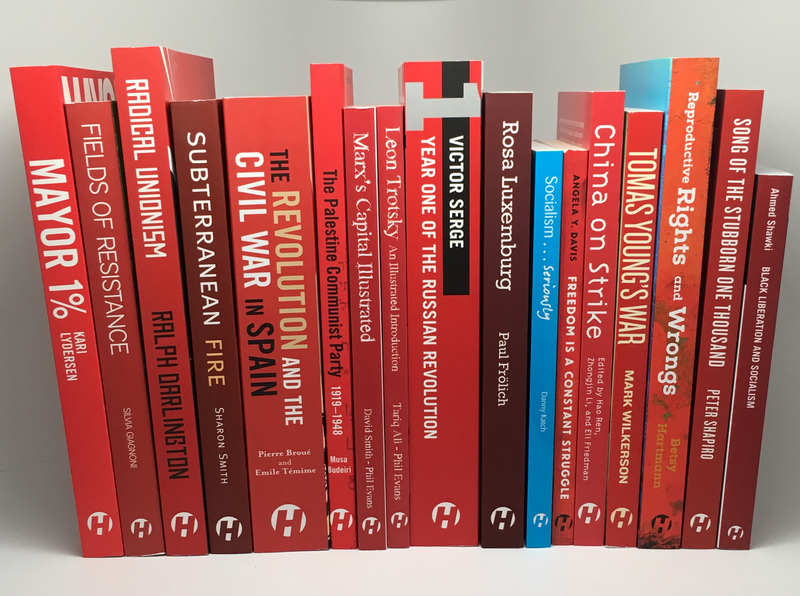 This is the year to introduce your favorite radical books to your family, friends, coworkers, neighbors, and comrades. We've assembled a guide of some of our books that make great gifts, with suggestions for (just about) anyone on your list. Below, we offer suggestions for the young person in your life looking for radical inspiration in the struggles of the past, the sports fan cheering on Colin Kaepernick as he continues to kneel for the National Anthem, or the family member or friend who's been asking you what we can do to resist Trump and fight for a better world. Oh yeah, and everything is 50% OFF until January 3rd! 101 Changemakers celebrates the unsung heroes who have fought for freedom and justice in the United States, with profiles of Tecumseh, Harriet Tubman, Elizabeth Gurley Flynn, Fannie Lou Hamer, Rachel Carson, Harvey Milk, Claudette Colvin, and many more. Facing a world of outrageous injustice, Angela Y. Davis challenges us to imagine and build the movement for human liberation. And in doing so, she reminds us that the road to liberation is long, and the struggle is constant. In the wake of the election, this updated edition of Solnit’s manifesto for hope in dark times has become a surprise bestseller. Here, she reminds us that hope can find root in an appreciation of our history, that ordinary people can and have changed the world. A manifesto for movement-makers in extraordinary times, Demand the Impossible urges us to imagine a world beyond what this rotten system would have us believe is possible. The winner of the 2016 Lannan Cultural Freedom Award for an Especially Notable Book, Keeanga-Yamahtta Taylor’s book has been universally praised as one of the best analyses of the Black Lives Matter movement and its roots in the long struggle for Black Freedom in America. A must-read for movement activists and supporters alike. First published in 2006, this classic is needed now more than ever. Chacón and Davis challenge the racism of immigration controls and argue for a pro-immigrant and pro-worker agenda that recognizes the urgent need for international solidarity and cross-border alliances in building a renewed labor movement. A crucial guide for understanding Islamophobia and its historical and political roots from early European colonialism to the “war on terror." Kumar highlights the relationship between anti-Muslim racism and empire building, an important and timely analysis that you won’t find in any US history textbook. Undivided Rights captures the evolving and largely unknown activist history of women of color organizing for reproductive justice—on their own behalf. The book articulates a holistic vision for reproductive freedom, refusing to allow our human rights to be divvied up and parceled out into isolated boxes that people are then forced to pick and choose from. The first anthology of poetry by and for the hip-hop generation, The Breakbeat Poets expands the definition of what poetry is, and what and who it is for. Featuring 78 of today’s most innovative hip-hop poets from across the United States, this is a unique collection of poetry as a living, breathing and radical craft that speaks to people’s daily lives. For two decades, Boots Riley's lyrical style has combined politically charged dissidence with a radical sensibility and sardonic humour to create what can only be described at sheer hip-hop poetics. Collected here in full alongside photos and backstories, Riley’s lyrics brim with grit, wit, and tenderness. Remi Kanazi's poetry presents an unflinching look at the lives of Palestinians under occupation and as refugees scattered across the globe. He captures the Palestinian people's stubborn refusal to be erased, gives voice to the ongoing struggle for liberation, and explores the meaning of international solidarity. Seen around the world, John Carlos and Tommie Smith's Black Power salute on the 1968 Olympic podium sparked controversy and career fallout. Yet their show of defiance remains one of the most iconic images of Olympic history and the Black Power movement. Here is the remarkable story of Olympian and lifelong activist John Carlos. Keeping up with the American elite can be tiring. This layman's guide to how the wealthy maintain control lays bare the various dogmas and delusions that prop up plutocratic rule in the post-meltdown age. Social criticism at its most incisive and irreverent best, Lehmann’s work punctures the cultural habits and institutions that keep the rich insulated from the rest of us. An extraordinary window into the black freedom struggle in the United States, The Black Power Mixtape offers a treasure trove of fresh archival information about the Black Power movement from 1967 to 1975 and includes vivid portraits of some of its most dynamic participants, such as Angela Davis and Stokely Carmichael. Martin Luther King Jr.'s "I Have a Dream" speech was a defining moment in the Civil Rights movement and a guiding light in the ongoing struggle for racial equality. By unearthing the story behind the speech, Gary Younge renews the power and relevance of King’s words for a contemporary audience, providing a critical modern analysis of what remains America’s most iconic speech. Includes interviews with King’s speechwriter Clarence Jones, Angela Davis, and other leading civil rights figures. A revelatory journey in which the personal and political become one. Revealing a unique ability to step back from the appearance of things to explore their deeper social meanings, Shawn grasps contradictions, even when unpleasant, and challenges us to look at our own behavior in a more honest light. A sharp commentary on the political and personal challenges of everyday life from an iconic playwright. Reflecting on their meeting with NSA whistleblower Ed Snowden, Arundhati Roy and John Cusack discuss the nature of the state, empire, and surveillance in an era of perpetual war, the meaning of flags and patriotism, the role of foundations and NGOs in limiting dissent, and the ways in which capital but not people can freely cross borders. A provocative and penetrating series of essays and dialogues that go to the heart of global power today, the inner workings of which Snowden’s revelations gave us a glimpse. Howard Zinn was a seminal figure on the left and undoubtedly one of the greatest modern historians. This series of speeches on protest movements, racism, war, and US history cover four decades of his passionate and profound involvement in struggle—an active engagement that Zinn saw as inseparable from his writing. Blending poetics, politics, and everyday life, the singular lyrics of Boots Riley, poet of the hip-hop underground are collected here.